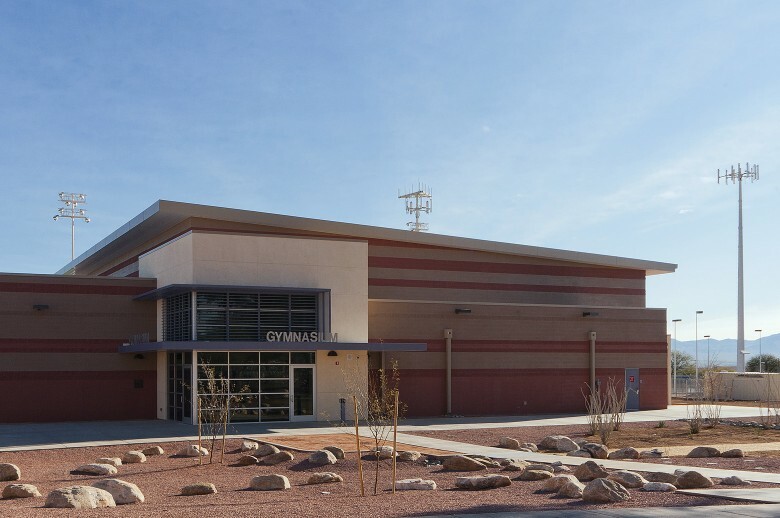 The Sahuarita Middle School Gym includes courts for basketball, volleyball, and badminton, a weight room, and a wrestling room/dance studio. At the old gym, located on this site, water issues were a major challenge resulting in building flooding and settlement. The solution involved shifting the building location within the site and implementing both water harvesting and improved drainage strategies. In addition to water harvesting, other green strategies include natural daylighting through skylights and clerestory windows and the use of high efficiency package units. The project cost was minimized by designing lockers that serve the gym and the adjacent Sahuarita High School stadium. This entry was posted on August 26, 2013 by swaim_admin.